Swedish immigrants from the province of Varmland arrived in the Smoky Valley of Central Kansas in the spring of 1869 to establish the community of Lindsborg. These settlers were pioneers in cooperative farming who brought with them deep religious convictions, a thirst for learning and an appreciation of beauty. The charming community of Lindsborg is located just minutes off the busy crossroads of Interstates 70 and 135. 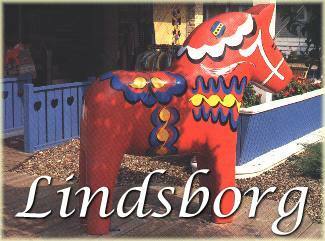 The Lindsborg experience is a special blend of history and culture. Rich Swedish heritage is reflected in the character of the community. Unique shops and restaurants, museums, art galleries and working studios, cultural and ethnic events, as well as great places to stay and lots of friendly people await you in Lindsborg. Valkommen. Swensson Park is located at 400 N. Main Street between Olsson and Swensson Streets. It provides picnic facilities, a children's playground, lily pond, the community bandshell, and tennis courts. Broadway RFD presents "Pirates of Penzance"